Norman learned nothing from his treatment at the loony bin. 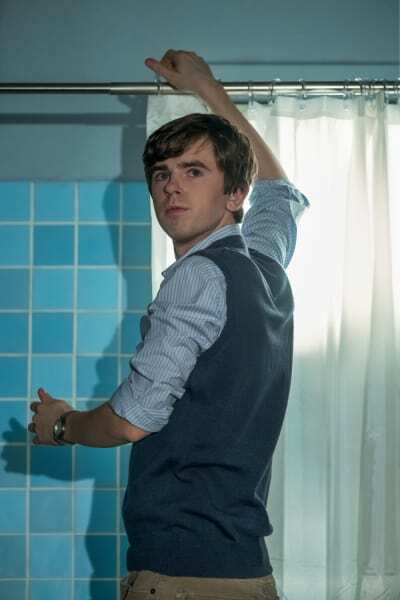 After watching Bates Motel Season 5 Episode 1, it's almost impossible to understand how he's a functional young man outside the confines of the motel property. 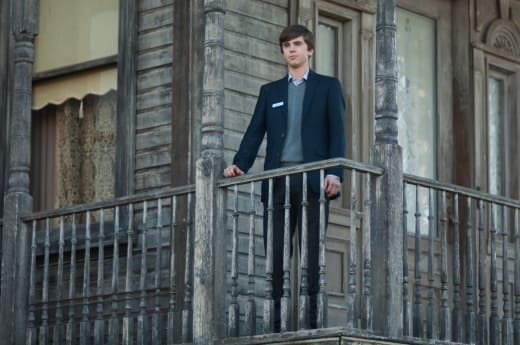 There's never been any doubt that Norman Bates was going to wind up a terribly mentally incapacitated young man, but he puts a whole new spin on crazy. 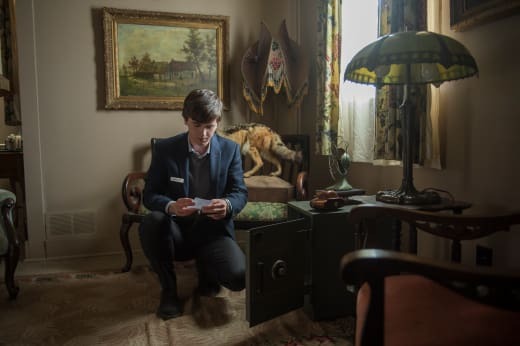 Somehow, Norman has managed to do things like buy shower curtains and log guests in and out of the motel. Sometimes he remembers doing it, others he doesn't. Norman's lucid when he goes to town to buy paint for the motel, even telling his new friend, Madeline, that his mother passed away and he runs things by himself. But at home (and sometimes outside the house), he's living a dual life with and as Mother. It's sometimes confusing for me, so it's bound to be impossible for poor Norman to be walking in his own shoes. What dream am I in Mother? Permalink: What dream am I in Mother? At one point Norman asks Mother if she's ever had the same nightmare over and over again. His alter ego is trying to tell him to be careful out there. The world is out to get him. Part of him is still the rebellious teenager who doesn't want to listen to his mother and the other half is running away from his own crazy, hoping his mother is still there, and he's not what he's become, knowing fully well he is. Norman is suffering a lot of blackouts, even carefully logging them in a notebook. While that's handy, I can't figure out how he'd know he blacked out. To know you're missing time, don't you need someone to verify you've lost it or have an event you don't recall? How amazing would it be if you had two sides, one of which blacked out and the other of which recorded the missing time they spent in your shoes as blackouts so you'd know you were missing? I do miss Norma, though. Her strength and pride have been overtaken by petulance and jealousy, traits that might have been found in Norma, but in Mother are expressed in a completely different way. Mother lives for and because of Norman. Of course, she knows that, but the way she knows it is interesting. Norman doesn't allow his Mother to be too much of a pushover, as he wants to keep some semblance of reality in his life. Norman: Oh mother, what is wrong with you? Mother: What is wrong with me? Oh. Let me see. Ahhhh. Well, for starters, I am dead. And why am I pretending to be dead? So I can get away from everyone and anyone who can distract me from YOU, OK? Norman: I know that, and I appreciate it. Mother: You appreciate it? You appreciate it like I baked you a coffee cake or something? I spend 24/7 in this house lookin' after you, feeding you, bolstering your moods, doing your laundry. I can't leave. I'm going nuts here. I literally gave up my life to protect you. To give you a life without trouble. And we're doin' it, right? We're doin' it. I mean, a mentally ill boy and a dead woman. We're actually doin' it. We have customers, we have a life. Norman: I know, and I appreciate it. Mother: STOP SAYING YOU APPRECIATE IT! Permalink: STOP SAYING YOU APPRECIATE IT! By all accounts, Norman should be exhausted. Early to bed and early to rise, as they say. He's living for two now and does the work of two. He carries on two parts of a conversation, worries for two, thinks on behalf of two and even kills and cleans up the mess for two. I was willing to believe there was no connection to the dead man and reality. Not only did Norman have no idea why the man was after him, but with the sheer number of things Norman makes up on a daily basis, why believe the guy was actually carrying a weapon? Yet when it came time for him to ponder the question, the fates were with him. What typically takes the work of two, Norman, in his powerful state of two, could do as one. He took a frozen body from a freezer and all the way to the car and a lake without anyone seeing him and by himself. Unless the guy was a little person, considering Norman's size, that was an amazing feat. Not to mention a frozen corpse would be even more difficult to move, being stuck in one position and all that jazz. It's not like you could roll it up into a carpet for easy disposal. And it would be hard and painful to your body. While we didn't see Norman's attempt to hoist the body over the edge of the canoe or rowboat, I'd imagine that would be a barrel of fun in itself. Of course, it was Romero. Who else had a bone to pick with Norman? Romero who didn't make parole. Whether it was before or after his parole hearing, he wouldn't want Norman alive either way. The bad news is if we're living the entirety of Bates Motel Season 5 in the same shortened time period, we won't see much of Romero, because you don't often get another parole hearing in short order. Then again, crazy loons don't often stuff their mothers and go on killing sprees in their motel, either, so who knows? With Caleb back in the picture, I'm betting on him paying his sister a visit. When he learns he no longer has a sister, this story will have to change, right? What a pleasant surprise to see Dylan and Emma, rings on their fingers, celebrating Emma's birthday with a baby in their arms! Please, oh please, don't let Emma's words to Caleb about bringing down Dylan with lies (all true, mind you) come back to haunt her because of what he will undoubtedly learn about Norma Louise and Dylan about Norman. I've had a soft spot for Caleb, so seeing him back in the picture trying to keep things right with Dylan made me happy. He loves Dylan, and love coming out of the ugliness of his childhood with Norma can't be all bad. No, it's not the best story to tell their daughter, but does Caleb's presence in her life make the story any more or less true? How does his absence keep Dylan from lying to his little girl? Maybe Emma has a magic potion to change Dylan's parents when they aren't present. Most kids ask about their grandparents, and if Dylan doesn't tell the truth about Uncle Daddy, he'll be lying. He could lie with a good relationship or with no relationship. I think the former would make more sense, but that's just me. I'm imagining Norman calling Dylan to tattle on Caleb's presence at the house. Maybe even Romero making a call. Somehow Dylan is going to get called back to White Pine Bay because it's unfair for him to be in the dark while his brother offed his mother and got away with it. I'm sorry, Emma, but you didn't marry into a healthy family no matter how you want to imagine it. God, I've missed these people. I'm going to keep missing them knowing their stay is coming to a swift end at the end of this season. Such brilliance, and the house and motel have already been torn down. What did you think of the premiere? Do you miss Norma? Are you happy Mother is at least annoyed with Norman? Are you surprised Norman has any strength living for two? Hit the comments and let's let this series go out in style! 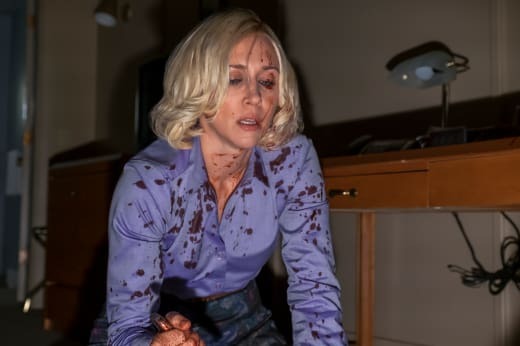 If you need to see it again, you can watch Bates Motel online to remember the living, breathing version of our precious Norma and her love affair with Alex Romero. 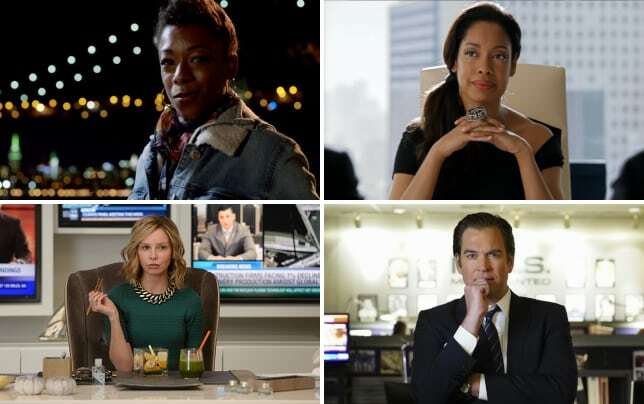 What show ending in 2017 will you miss the most?